Saturday, April 5 from 2-4 p.m. Joseph Kempler and myself will be on hand for a special presentation at the Washoe County Northwest Reno Library. I will give a brief biography of Joseph’s life as well as a description and overview of the six concentration camps Joseph was imprisoned in. Also, Joseph will be available for a Question and Answer session. 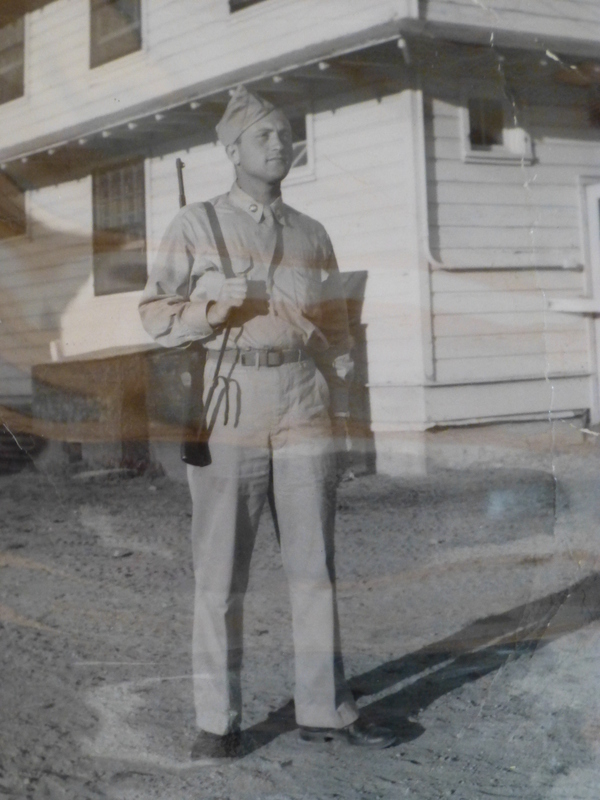 In the background, projected onto a screen, will be a photograph display of some of Joseph’s family pictures. Books will be available for purchase and signing. We are excited to share Joseph’s amazing story of survival, of faith lost and regained, and of family bonds strengthened. Joseph Kempler is eleven years old in 1939, when World War II begins. German soldiers have invaded his hometown of Krakow, Poland. Forced with his family to leave their home, business, and belongings, Joseph embarks upon an adventure that will change his life forever. Joseph survives six concentration camps, some of them death camps, from the ages of fourteen to seventeen. Along the way he abandons family and faith. He curses God for allowing the Holocaust to happen and becomes an atheist. When he arrives at the concentration camp Melk, he encounters, from a distance, an unusual brand of Christians. He is told they are called Bibelforscher, Bible Students. He is astounded to see these Aryan’s imprisoned in the same concentration camp as Jews. He is further shocked when he learns that they can leave the camp anytime, all they have to do is renounce their faith by signing a document. But they won’t do it. This leaves and indelible impression on young Joseph’s mind. Many years later, after emigrating to America, Joseph encounters representatives of this group when they knock on his door. Always curious about their faith he questions them and ultimately converts to Christianity. THE ALTERED I chronicles Joseph’s life and the circumstances leading to his life altering decision, while shining new light on an untold story of the Holocaust. Born in Southern California, April Kempler currently resides in her “adopted” city of Reno, Nevada. She lives with her husband, who doubles as her editor-in-chief. 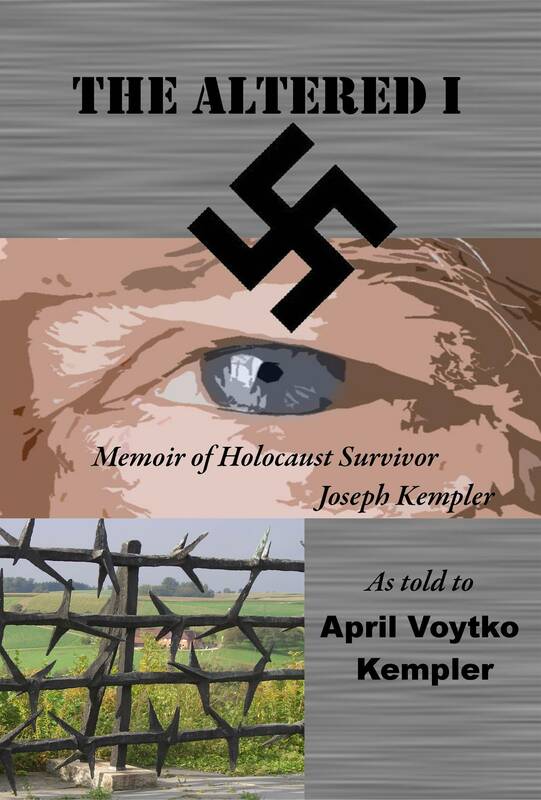 April Kempler’s first book entitled The Altered I, a Holocaust Memoir, is a first-person narrative about the Holocaust. April loves reading, a habit she picked up as a child. Instead of playing with the other kids, she could be found with her nose in a book. She reads a variety of genres, but is especially drawn to historical fiction. When Kempler is not writing or reading, she assists her husband in their window treatment design business answering the telephone, making appointments and helping to install gorgeous draperies on naked windows. Where to purchased The Altered I online: Amazon.com and Google play. Two blocks from my family’s apartment on B street, stands the old synagogue where I used to worship with Tatuś. The Nazis destroyed every temple and synagogue in Krakow during the war, but this synagogue has been renovated and converted into a museum showing what the Jewish culture used to be like in the Old Town. I’m traveling with my sons, daughter and grandson and I want to show them this place, however it is a tricky business, my daughter and grandson are Jewish while I and my two sons are Christian. We have two seemingly contrasting points of view, but the synagogue is important to my history and I can’t pass by without peeking inside. As we enter the synagogue there is a table with Yarmulkes–black skull caps used to cover the head while inside the synagogue. It is forbidden for Jews to enter the synagogue with their heads bared. Since I no longer practice Judaism I didn’t want to wear a Yarmulke. My oldest son David, picked one up, then put it back down on the table. The curator, Mr. J looked at us in puzzlement. I didn’t want to offend him so I explained that my faith didn’t allow me to take this action. Normally he wouldn’t let any male enter with a bare head, but taking into consideration my history and why we were here he made an exception. He allowed us to enter and tour while he described to us in Polish the various details about the synagogue. To my knowledge there are few religious Jews in Krakow. I feel disappointed that so few people will see the beauty of this building, not too many take the time to visit. It’s a shame because Mr J has put so much time, money and energy into restoring the synagogue. I look at him in awe. He works around Krakow restoring synagogues and cemeteries to their former glory. But I have to wonder to what purpose? The buildings and architecture are beautiful, but my impression of this particular visit is powerful, and different for reasons other than one might expect. Although it’s my history, my memories, my family traditions, I can’t help thinking this is a dead town for Jews. Whatever is being done here is for tourists. Soon there will be more synagogues than Jews in Krakow. Is he really restoring a dead town? There are fronts of buildings with signs and names on them, but there is nothing inside except candles burning. It is for show, it isn’t real. I remember this as a lively part of town with over 60,000 Jews. There was culture, music, theater, Jews enjoying their lives, now there is nothing. Nothing for me anyway. THE ALTERED I available on Amazon.com and LeRue Press. Related Post Excerpt on Wash Day. 1. Prepare your writer by giving it the right environment. This may seem simple: pen, ink, paper…er, computer, keyboard, writing software (that’s the one I like!) Whatever your tools, your writer has needs, supply them. Is the space frequented by family members or roommates? Or is it secluded? Is the area cluttered, organized, or a healthy mixture of both? Does the environment include music? Either Punk, Classic Rock, Country, or Classical? I prefer to give my writer quiet time, but that’s just me. 2. Give your writer plenty of water, food, and sunlight. This means you have to nourish your writer by reading. Read your favorite authors, read ones you only like so-so. Read fiction (any genre), read history and nonfiction, read memoirs and biography, read about science and biology. Reading expands your writer’s knowledge so your writer can–you know–write. It will also help develop your writer’s tastes and style. Your writer will also learn what they don’t like to write about and what they do like to write about. In addition, your writer will learn how not to write. Of course this is subjective to each writer. 3. Fertilize your writer in the form of praise. Your writer could succumb to crippling self-doubt, lack of courage, or simple procrastination, resulting in stunted growth. Praise is essential, not too much though! Over-praise will burn the tender growth, and what you will be left with is an unproductive writer. The objective is to have a steady flow of creative sprouting. 4. Maintain and watch your writer. Pull out any weeds of distraction, or toxic negativity. These will choke the writer and diminish growth. 5. An idea, somewhat debated, is to surround your writer with sound. This may stimulate growth. Perhaps the vibrations your writer receives are in the form of a writer’s group or forum. Hearing feedback and constructive criticism can be beneficial for encouraging growth and inspiration in the writer. But it is up to you, really. Of course this is all tongue-in-cheek, but I hope you gleaned a few good tips on how to grow as a writer. What is your writing technique? What has worked for you? I’d love to hear about it in the comments section of this blog. Recently I was invited to speak at a Holocaust Remembrance Day event at the University of Nevada, Reno. The actual days of remembrance for 2014 begin on April 27. But there are a lot of reminders going on throughout the month. The theme for the event I will be speaking at, however, is Genocide. In preparing my speech I pondered having my husband share his personal side of the story. I’m not one to hog the limelight! Ask anybody, I’m not a public speaker, but since the release of THE ALTERED I, I have had to step out of every comfort zone I may possess and become what I need to in order to promote awareness for the book. But I digress. The reason I thought of Paul is because it is his family that is directly affected by genocide. Who else could talk more freely on the subject? What he said touched me. He talked about how if his father hadn’t survived he would never have been born. He said he lost his connection to his father’s side of the family, no grandparents to share summer vacations with or school report cards. He only had one bitter aunt who survived the Holocaust, his father’s eldest sister, but found it difficult, if not impossible, to share her ordeal. Because of genocide his father disconnected emotionally from his wife and children. Conversely had his father not gone through the Holocaust at all Paul might not have been born anyway. So it is interesting to think that because of genocide Paul is alive. Not to say we welcome genocide, but life really does hang by a fragile thread, it’s a miracle when you think about it. In this country we are relatively free from the impact of genocide, but we have other things. Perhaps PTSD from some traumatic experience. Who hasn’t been touched by the war in Afghanistan? Every day I see commercials on TV asking for donations for wounded warriors returning home to their families. There is a lot of trauma that goes on behind closed doors. We aren’t aware of what people in our neighborhoods are really dealing with in their lives. So even if genocide hasn’t directly affected you, I’m sure you’ve been affected by some trauma. How are you coping? Will this year’s annual Holocaust observance inspire you? What will you learn? What will you change? I love hearing from you! Please leave comments in the area below. Related article on inheriting stress genes.